Grace under a Bridge America has no shortage of megachurches that glimmer with stage lights and thunder with deafening sound systems. But one of my favorite churches doesn’t have any lights. No building, no stage, no bells and whistles—it doesn’t even have a paid pastor. 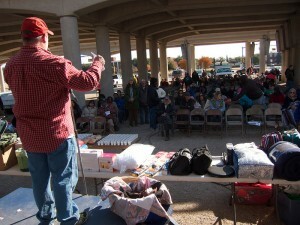 In fact, this particular church meets under an overpass off I-35 and Fourth Street in Waco, Texas. The Church Under the Bridge, as it’s aptly called, is a powerful portrait of the incarnation—God taking on flesh. In 1992, Jimmy and Janet Dorrell left the suburbs to reach out to several homeless people living under an overpass. They began by leading Bible studies and caring for practical needs, and as the gatherings grew, the Dorrells ended up starting a church. But they didn’t hustle everyone back to the suburbs where churches belong. They stayed right there where the people were, right there under the bridge. Today, hundreds of the most diverse people you could imagine gather every Sunday to worship Jesus. Recovering addicts, college students, affluent businesspeople, homeless mothers, and truckers who just drove over the church all gather in unison to celebrate Jesus’s victory over their sin. “An ordinary church made holy by His presence” is their motto, and it could not be more theologically sound. Cigarette smoke and cheap perfume waft through the air, purified by a thick aura of grace—all because one suburban couple decided to incarnate. Instead of stoning his fiancée, Joseph decided to divorce her.1 But God stopped him in his tracks and convinced him that Mary’s Holy Ghost story was actually true. So Mary and Joseph endured the shame together once Mary’s belly expanded into evidence. Luckily, Rome called for a census, which required the couple to leave Nazareth and travel to Joseph’s village of origin: Bethlehem. The rugged journey provided a soothing respite from public shame, no doubt. But once they entered Bethlehem, more judgmental eye- brows were raised and the scandal continued. 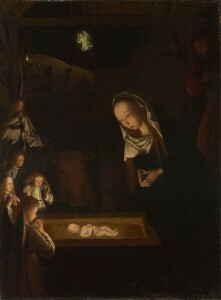 Popular renditions of the Christmas story reflect little historical truth. Jesus was most likely not born outside of a commercial “inn,” as our English translations suggest (Luke 2:7). The word kataluma can refer to an ancient motel, but it usually refers to a spare room of a house, not an “inn.” There probably weren’t any commercial inns in a small village like Bethlehem, so “spare room” is the best translation of the word kataluma.2 So when Mary and Joseph sought shelter in their hometown of Bethlehem, they almost certainly went to a house of a relative and asked to stay in his spare room, his kataluma. Extending hospitality to the unwed couple would give approval to their relative could not risk the shame. So Mary and Joseph remained out- side in the courtyard, where the animals were kept at night. tion and ridicule was drowned out by the jubilance of a newborn child. No doctor, no instruments, no sanitation, and no painkillers. Childbirth in the first century was a risky event. But God endured the shame, the risk, in order to bring us back to Eden. As Mary grunted and pushed, heaven came crashing down to earth, and Joseph received the Son of God, the snake-crushing Messiah, the illegitimate child into his arms. First some hair, and then the head. Shoulders and arms, legs and feet. The One who made the stars passed through the birth canal and into Joseph’s nervous hands. Joseph slashed and tied the umbilical cord, wiped the blood and birth away from the child’s eyes, and assisted his helpless son to expel the remaining fluid from His lungs. Cradling this eight-pound miracle, he watched the breath of life expand the baby’s chest, and an urgent wail pierced the courtyard and spooked the sheep. After nursing the child to soothe His fear, Mary wrapped her son—God’s Son—in cloth, and with no crib nearby, she laid Him in a feeding trough. The One who spoke the universe into existence, who reigns over the nations, who commands history, who created you and me in His own image chose to be laid in a box where animals ate grain. The One who formed galaxies and molded the earth suckled the breast of a thirteen-year-old unwed Jewish girl in a small village of a backwater province of the Roman Empire. Jesus is a religious leader, but the religious leaders didn’t want Him. Jesus is a king, but the kings didn’t want Him. Jesus is a revolutionary, but the revolutionaries didn’t want Him. Jesus is the perfect human, but humanity didn’t want Him. You didn’t want Him, but He wanted you. We are hunted and loved by an Ezekiel 16, tent-dwelling God with a beautiful tattoo. And His hunt landed Him in a feeding trough. *This blog is from my book Charis: God's Scandalous Grace for Us, pp. 133-137.